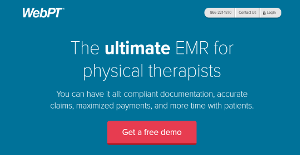 WebPT aims to help physical therapists run their clinics more efficiently and provides a web-based EMR (Electronic Medical Record) and documentation solution. It minimizes paperwork and manual labor and aids in transforming a traditional clinic into a digital one. The software works well for busy physical therapy clinics and provides an easy-to-use interface. It ensures accurate claims, compliant documentation and maximized payments, which ultimately results in giving more time and care to patients instead of wasting time on paperwork. WebPT’s EMT, Scheduling, Billing and Outcomes provide a comprehensive solution to put everything at one place. Being a web-based software, it’s accessible from anywhere from any internet-enabled device and does not require any additional hardware or software to work. It’s also fully HIPAA compliant, which ensures compliance, reduces errors and maximizes reimbursements. WebPT product line consists of EMT, Scheduling, Billing and Outcomes modules and helps clinics stay compliant and maintain accurate and defensible documentation. It increases efficiency by putting information at fingertips and allowing working on the go. Users can easily document, schedule and bill anytime from anywhere using a device of their choice. Software’s updates are also always free and ensure that clinics are running the most recent version without any intervention from users. The EMR module helps clinics document efficiently and create compliant, accurate and complete documentation for OTs, PTs and SLPs. The documentation includes initial evaluations, daily notes, progress notes and discharge summaries, which can be emailed or faxed directly from the system. The software also takes security seriously and supports back-level encryption and automatic backups. It also simplifies Medicare compliance through integrated functional limitation reporting, 8-minute rule calculations, therapy cap tracking and CCI edit alerts. The customizable scheduler allows accessing clinic schedules from anywhere and automatically sends reminders that ultimately results in reduced cancellations and no-show ups. The patient reminders can be send via email, text or phone. External files can also be uploaded directly into the patient charts using eDoc, including diagnostic images, physician referrals, intake forms, signed plans of care and more. The billing software connects with the documentation for accurate and timely submission of claims, ultimately resulting in an improved and consistent cash flow. The Outcomes tracking software is particularly useful for rehab therapists and helps optimize clinical and other business operations. It allows collecting and tracking the feedback from patients for better service quality and helps identify trends to plan accordingly. The performance metrics can be compared with national averages and other benchmarks for better performance monitoring. If you are considering WebPT it may also be a good idea to check out other subcategories of Best Business Process Management Software listed in our base of SaaS software reviews. Enterprises have diverse wants and requirements and no software application can be ideal in such a condition. It is futile to try to find an ideal off-the-shelf software system that fulfills all your business needs. The smart thing to do would be to modify the solution for your specific wants, staff member skill levels, finances, and other factors. For these reasons, do not hurry and invest in well-publicized leading applications. Though these may be widely used, they may not be the perfect fit for your particular needs. Do your groundwork, check out each short-listed system in detail, read a few WebPT reviews, contact the vendor for clarifications, and finally choose the application that provides what you need. How Much Does WebPT Cost? We realize that when you make a decision to buy Business Process Management Software it’s important not only to see how experts evaluate it in their reviews, but also to find out if the real people and companies that buy it are actually satisfied with the product. That’s why we’ve created our behavior-based Customer Satisfaction Algorithm™ that gathers customer reviews, comments and WebPT reviews across a wide range of social media sites. The data is then presented in an easy to digest form showing how many people had positive and negative experience with WebPT. With that information at hand you should be equipped to make an informed buying decision that you won’t regret. What are WebPT pricing details? What integrations are available for WebPT? Pros: I love how WebPt integrates all elements that we address in PT documentations. All medicare requirements like FLR and PQRS ensures us to use codes that are billable such as ICD-9 and ICD-10, it helps us with new CPT codes as well. They work great with our billing vendor and the electronic billing is much easier than before. Our documents are well-kept and we are able to access them from any device, there is no need to add storage to our computers anymore. Cons: I believe they work hard to keep up with their growth but the response time from their customer teams can be slow form time to time, but the response is within 24h. It would be really helpful if they could implement functionality of a pop-up alert whenever some pages are open this way we can alert our users to critical info. Pros: WebPt allows an access to patient records from anywhere, we don’t have to use paper charts and to be in the office all day. I love the integration with Therabill, because it helps us to streamline most important parts of the work. We love the communication with experts when it comes to billing and coding. It helps us to better organize Medicare rules, diagnosis and billing codes, personnel requirements and many other admins issues. The monthly fees are affordable and these is not upfront cost. Cons: I don’t like when the site is down for maintenance, even though we get alerts and I’m aware of the scheduled maintenance. I highly recommend WebPt it's easy to use and extremely useful. If you need more information about WebPT or you simply have a question let us know what you need and we’ll forward your request directly to the vendor.